The United States Mint is now selling its latest product for coin collectors, the 2017-W Uncirculated American Silver Eagle. 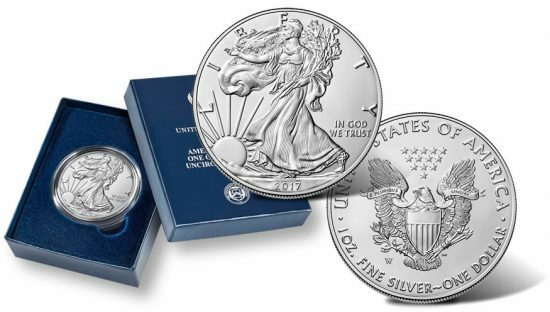 The uncirculated silver coin appears most like its bullion counterpart, which is intended for investors and has sales of over 12.1 million since launching in January. Its uncirculated finish is further distinguished by a "W" mint mark to denote its striking at the U.S. Mint facility in West Point. Annually released since 2006, except for 2009 and 2010 when silver blanks were reserved for the bullion version, the uncirculated coin is one of the U.S. Mint’s flagship products. Like with the companion bullion and proof editions, it is composed in 1 troy ounce of 99.9% pure silver. Pricing at $44.95 matches last year, when the U.S. Mint issued a special edition featuring a flat edge with anniversary lettering. This year’s coin returns with its traditional reeded edge. Order the uncirculated American Silver Eagle from the United States Mint at www.usmint.gov. A link to the Mint’s American Eagle products is right here. The silver coin is encapsulated, presented in a blue display case, and accompanied by a certificate of authenticity.